MONDAY - FRIDAY 8:30AM - 5:00PM. We are exclusive dealers of Wood Mode and Crystal Cabinetry. Learn more of what our exclusives lines have to offer below or visit us in person to become more familiar with our product lines. Proudly made in the USA since 1942 in Pennsylvania. Majority of the cabinetry making process done by hand. Superior quality,craftsmanship and furniture quality finishes. Dedicated to protecting the environment. Each cabinet is individually hand wrapped. Shipped using professional furniture carriers. Specialty options - specialty doors, veneers, custom colors and finishes, furniture pieces, mantles and wardrobes. Wood-Mode has been certified by the Kitchen Cabinet Manufacturers Association (KCMA) as meeting the standards for its Environmental Stewardship Program (ESP). This program recognizes manufacturers who use environmentally friendly materials and production processes. To qualify for and maintain certification, manufacturers are evaluated annually on compliance in five categories, including air quality, product resource management, process resource management, environmental stewardship, and community relations, as well as energy conservation and recycling programs. Proudly made in the USA since 1947 in Minnesota. Every cabinet is built one at a time. Custom "green cabinetry" - No added formaldehyde, recycled materials and rapidly renewable materials. Can earn LEED points. Facilities recycle more than 100 tons of paper and cardboard per year. Match any color from Benjamin Moore and Sherwin Williams. Green-Core plywood and particleboard contains renewable wood fiber with no added urea-formaldehyde resins. Green-Core plywood is made with a patented soy-based resin and no added urea-formaldehyde. Green-Core particleboard is 100% recycled with a no added urea -formaldehyde exterior-grade resin. Quality, Resource Management of Product and Process, Environmental Stewardship and Community Relations and is an approved participant in the KCMA* Environmental Stewardship Program. 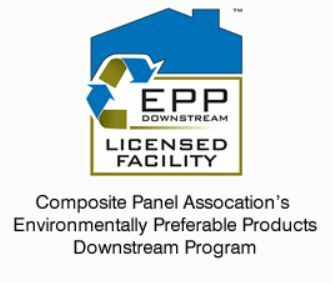 Products made with CPA*- certified EPP* composite wood panels are among the greenest you can buy. This seal is your assurance that the products you're getting from Crystal are environmentally responsible. Harvested from forests that are well-managed to meet the social, economic and ecological needs of present and future generations. Green finish options: GreenGuard® certified, Zenith G1™ ultra-low emitting topcoat, water-based stains and other water-based finishes.